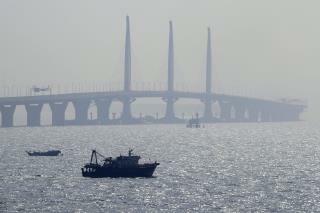 (Newser) – The construction of the world's longest sea bridge, a nearly decade-old project already bogged down by lawsuits, money problems, and other holdups, now has another complication to contend with: Some say parts of the bridge are "floating away," per the Guardian. The new issue for the 34-mile bridge meant to connect Macau, Hong Kong, and the city of Zhuhai in China revolves around dolosse, reinforced concrete blocks used to keep waves from eroding structures. Drone photos taken last week of one of the bridge's man-made islands (there are also new roadways and a below-water tunnel that will make up the final sea bridge) seem to show some of the blocks underwater and not attached to a protective barrier, which has raised concerns on the Hong Kong side that the structural integrity of the island, which is being built by a Chinese contractor, is compromised. You can cross that bridge but you'll want to cross it again in an hour. One of the biggest scandals you've never heard of is Chinese Colleges. Having a University Degree is a matter of great prestige in China, & if it looks like a son of a Party member is funking out, pressure is applied to see he does not. And some "degrees" are purely ceremonial, given to the sons of Generals & ranking Party members, even though the kid never does anything but drink. These include Engineering Degrees. That bridge makes me nervous.